OTHER GEMS Ruby,Sapphire. PLATE 925 Silver. PRODUCT TYPE Necklace. MAIN STONE SHAPE Rough Natural. MAIN STONE COLOR Top Rich Green. TOTAL weight 56.72 ct (total weight of silver stone). All products are originally 100% manufactured in THAILAND. Metal: Sterling SilverStyle: Strand/StringLength: 16 - 17.99"
NATURAL AFRICAN RED RED RUBY & FRESH PEARL ROUND CABOCHON BEADS JEWELRY SET. STONE'S ORIGIN : AFRICA (RUBY) INDIA(PEARL). 22" Outer Strand length. PERFECT FOR ANY OCCASSION~ BE AT YOUR BEST~ ADDS ON THE GRACE ~. Yes they are not of highest grade but are 100% Natural. These are then oil color enhanced to add more beauty. So if you are looking for genuine gems and have a low budget this is best deal. -- More About The necklace --. Ending 25 Apr at 2:06AM BST5d 20hFrom IndiaStyle: Strand/StringBrand: HandmadeLength: 16 - 17.99"
Beautiful necklace, tons of sparkle and fire. Over 15 carats Natural Ethiopian fire opals, rondelle shaped 2mm beads and a 5mm center round faceted shaped Ruby 2 ctw. And 6 Genuine ruby accent stones 3mm total 2ctw. Style: Strand/StringLength: 16 - 17.99"
This is a three strand ruby gemstone necklace with matching earrings. The beads are of excellent quality and have brilliant cut and luster. RUBY GEMSTONE NECKLACE. Color - Red. Weight - 150 carats appx. Ending 25 Apr at 3:02AM BST5d 20hFrom IndiaStyle: Strand/StringBrand: HandmadeLength: 16 - 17.99"
RARE NATURAL FACETED GEM PINK RUBY RONDELLES RUBIES 14K GOLD NECKLACE 17.25"
Ruby faceted rondelles, 14K yellow gold beads. The necklace is finished with 14K solid yellow gold lobster clasp. 100% REAL RUBIES AND REAL GOLD! 17.25" (SINGLE STRAND) GENUINE NATURAL DEEP MAGENTA PINK FACETED RUBY AND 14K SOLID YELLOW GOLD NECKLACE featured of. Metal: Yellow GoldStyle: Strand/StringLength: 16 - 17.99"
Ending 22 Apr at 1:52AM BST2d 19hFrom IndiaStyle: Strand/StringBrand: HandmadeLength: 16 - 17.99"
Ending Saturday at 5:22AM BST23h 16mFrom IndiaStyle: Strand/StringBrand: HandmadeLength: 16 - 17.99"
The beads are of excellent quality and have brilliant cut and luster. Size of Beads - 4mm-5mm. Color - Red and Green. Faceted Ruby Four Strand Bead Necklace. This beautiful, bead necklace features 4 strands of faceted Madagascar rubies. Shape: Faceted. Type: Ruby. Colour: Red. Necklace specifications. The necklace is also decorated with small ruby beads. This lovely piece fastens with a 14k yellow gold lobster clasp. Doing so is against United States and International laws. The beads are of excellent quality and have brilliant cut and luster. Chain - 925 Sterling Silver. Color - Green and Red. Origin - Brazilian Mines and African Mines. Gemstone :Genuine Black Spinel & Ruby necklace. -- More About The necklace --. There are four strand of genuine ruby beads, the strands are all in excellent condition. There are well over 100 carats of ruby beads in the four strands. The ruby beads are not individually knotted. This is a solid 14k ruby knotted necklace. and it is gorgeous! there is an authentic sapphire and tourmaline placed at the clasp end for added beauty. the gold is authentic and marked "585". the rubies are authentic and chosen for their brilliance & bright red color. 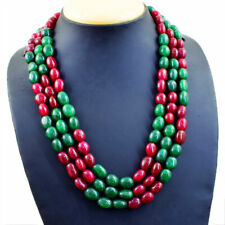 Breathtaking Quality 7 Lines Beaded Natural Untreated Ruby Necklace. LENGTH :17" Wearable Length - 23" Long Approx. 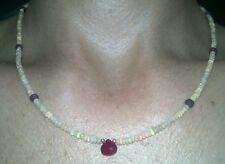 EXCLUSIVE NECKLACE MADE OF 100% NATURAL AFRICAN RUBY. SUITS YOU AND YOUR PERSONALITY. Up for sale is a beautiful Ruby Roundel Beaded Necklace. for a total gemstone weight of 9.00 carats. These are set in 925 sterling silver and it has a nice large lobster claw clasp. MODERN 18KT YELLOW GOLD NECKLACE. STATION BY THE YARD DESIGN. FEATURES 6.48 CARATS OF RUBIES AND 11.96 CARATS OF OPALS. WRITTEN APPRAISAL SERVICE AVAILABLE. Jewels By Sam | Fine Modern & Estate Jewelry. Gemstones: ruby. Material: 18k yelllow gold. Pendant: 2" long x 0.56" wide. We also have a wide selection of new and modern pieces as well as individual loose diamonds. Doing so is against United States and International laws. Yes they are not of highest grade but are 100% Natural. These are then oil color enhanced to add more beauty. So if you are looking for genuine gems and have a low budget this is best deal. Gemstone :Genuine Ruby necklace. Brand: HandmadeLength: 16 - 17.99"
This authentic Carrera y Carrera piece is finely crafted from solid 18k yellow gold. It is fully signed with Carrera's hallmark, the gold content and serial number 124252. Don't miss out on this one! BEST QUALITY 136.00 CTS NATURAL UNTREATED RICH BLUE AQUAMARINE BEADS NECKLACE. hope you could understand. hope you understand. Ending Sunday at 10:33PM BST2d 16hFrom IndiaStyle: Strand/StringTheme: BeautyLength: 16 - 17.99"
Beautifully matched, in color and size, faceted ruby beads. Ruby & 18kt White Gold Necklace. Marked: 18k on clasp. This stunning, genuine necklace features. In Good Estate Condition! String Necklace Pearl and Ruby Yellow Gold Setting Here is a string sapphire necklace that holds Pearl and Ruby Gems 4-6mm size of gems 17 inches long of string necklace that holds 68.0 carats of Rubies an 15 carats of white pearls accentuated with 14KT solid yellow gold lobster clasp Comes with a necklace box SKU: 15392 Our items are brand new, not re-polished!!!! 100% NEW!! !Think about our offer and realize how much money you can save with VERACCI JEWELS. CHECK OUT DAILY ON OUR NEW POSTED ITEMS. VERACCI JEWELS has been in the market for almost 48years. We are a known jeweler located at downtown Los Angeles, California. We promise to bring new items each day and display most of our original designs and concepts in the most fashionable and affordable way. Hope you understand. hope you could undersand. Theme: BeautyLength: 16 - 17.99"
Gemstone : Genuine Ruby necklace. -- More About The necklace --. Note . There is an authentic sapphire and tourmaline placed at the clasp end for added beauty. this is a solid 14k ruby knotted necklace. and it is gorgeous! the gold is solid 14k white gold and marked "585". Shortest Strand 16" Longest Strand 20". Real Earth Mined 7 Strand 20" Necklace. The Ruby's are "Dark Red" not Pale as shown in the photo's. Round Approx 500 ct Beads Approx 4-5 mm. Overall Length End To End 21". Necklace Ruby 3 String 18" Earth Mined Carved Bead Approx 6-9mm E369/71. Real Earth Mined Colour Enhanced Three Strand. Carved Approx 680 ct Bead Approx 6-9 mm 18" of bead Necklace. Shortest Strand 16" Longest Strand 18". Emerald,Ruby and Sapphire Necklace 20" 613.50ct Round 4-5mm Bead E317. 6 Strand 613.50ct 4-5mm Bead Necklace. Strands: Shortest 16" Longest 20". Necklace Ruby 17" Natural Untreated Earth Mined Faceted Approx 4x2.5mm E269/270. Faceted 79.50ct Bead Approx 4 x 2.5 mm 17" Necklace. Natural Not Enhanced not treated One Strand. Necklace Ruby in Zoisite Rare 19" 635ct 5-13mm Round Bead E304. 3 Strand 635ct Round 5-13mm Bead Necklace. Ruby in Zois ite. Wear it Long or Wear it Short. Ruby: 3x4mm. Size approx. : -necklace: 17-19.5" long. Center Ruby Bead Size - 10 mm. 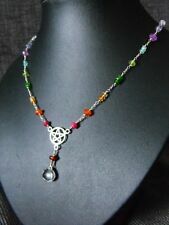 This is a two row multi gemstone necklace to match all dresses. Can be worn any occasion, formal or casual wear, office wear. The beads are of excellent quality and have brilliant cut and luster. The beads are of excellent quality and have brilliant cut and luster. Secondary Stone Ruby. Main Stone Color Green and Red. Color - Red and Green. Main Stone Shape Round. Main Stone Creation Natural. Over 21 carats of 3mm rondelle shaped Rubies and three 6mm oval shaped 2cts of Natural untreated Ethiopian fire opals. All solid 14k gold accent beads and spring clasp. Main Stone Ruby. Main Stone Color Red. RED RUBY BEADS NECKLACE. Cut - Faceted Beads. Beads Size - 3 - 3.5 MM. Quality - AA Finest Quality. Color - Red. We are Manufacturers and Wholesalers ofGemstones (Precious and Semi - Precious), Gold Jewellery, Artificial Jewellery and Silver Jewellery (Purity - 92.5). Style: Strand/StringTheme: BeautyLength: 16 - 17.99"
Ruby faceted rondelles, 14K yellow gold beads. The necklace is finished with 14K solid yellow gold lobster clasp. 100% REAL RUBIES AND REAL GOLD! Main Stone Shape RONDELLES. 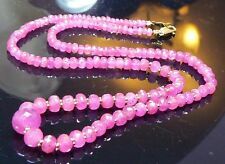 17.25" (SINGLE STRAND) GENUINE NATURAL DEEP MAGENTA PINK FACETED RUBY AND 14K SOLID YELLOW GOLD NECKLACE featured of. Failing to do so will results in the item being re-listed.